Lake Iseo – Did you know? In 2005 an extensive underground labyrinth was discovered, stretching from Lake Endine to Lake Iseo. A small group of cavers came across a rock crevice (the size of a 2 euro coin) in the Fonteno valley from which particularly cold air was being emitted. Immediately they realized that something was hidden under there so they decided to dig a hole. Soon they found themselves facing what is now called the Abyss Bueno Fonteno – a gaping chasm of 18 kilometers by 500 meters. Further exploration led to the discovery of the largest cave in the Bergamo area and among the top twenty in Italy. Fairly recently another cave was discovered and named Nueva Vida. It turns out this cave is connected to Bueno Fonteno and together they make for forty kilometers of galleries, falling to depths up to 600 meters and even a third lake. Amazing: so between Lake Iseo and Lake Endine, in the Val Cavallina a third underground lake..is concealed. Boario Terme, to the north of Lake Iseo, was established as a spa towards the end of the eighteenth century with the construction of the Casino Boario. Here they administered “healthy water magnesium and iron vitrinolate” The first mention of “medicinal springs” can be attributed to Father Gregorio Brunelli (Vallecamonica – 1698), but the therapeutic properties of thermal springs had been known since the fifteenth century. In the second half of the 19th century Boario Terme became a health resort and fashionable meeting place for the rich middle class: the “Ancient Water Source” it even appeared in the shops of Milan’s and many chemists. Today, thanks to the presence of four different mineral water sources, Boario is one of the most unique thermal centres of Italy and offers a wide range of treatments that cure various ailments. Mount Trentapassi not only features in several paintings of Leonardo da Vinci, it is also home to a yearly event in Spring called the Skyrace. The Skyrace is all about skyrunning – running in the mountains over extremely technical trails – with lengths that exceed over 18 kilometers. Departing from Marone athletes face two kilometers of flat land. In the subsequent 3.5 kilometers they will go up to 1050 meters. Reaching the top of the Corna Trentapassi (1250 meters above sea level) the trail then falls in the direction of Zone alternating stretches of descent from extreme to just difficult which will test the legs of any athlete. Near the town of Solto Collina, located at an altitude between 350 and 700 meters above sea level, this natural reserve of about 70 ha boasts a wide variety of plant species (among which edelweiss, gentians and rhododendron) that are normally found at 1000 meters and more often at 1500 meters of height. This is due to a micro-thermal phenomenon that takes place with the emission of freezing air from some “cold holes” or gorges in the ground. The Natural Reserve is also the perfect place for birdwatching, thanks to the 28.000 species of birds living in this environment. The site can be visited only on Saturdays and Sundays in May, June and July. The entrance is free. The Antica Strada Valeriana (Cai path 291) was the only route to Valle Camonica for many thousands of years. Fully revamped and reinstated for tourism purposes, the route is today a harmonious encounter between landscape, art and history. The route runs along the hinterland of the eastern shore of the lake, from Pilzone d’Iseo to Pisogne (there is a project in progress to extend it as far as Monticelli Brusati and Ome), passing through the territories of Sulzano, Sale Marasino, Marone and Zone. The trip is extraordinarily stunning because there are always views of Lake Iseo and the surrounding mountains. The route is indicated at junctions and intersections by information boards, arrows and a yellow and brown coloured V. The Antica Strada Valeriana is also cited as the ‘Route of Spiritual Devotion’. The presence of churches, shrines, monasteries and chapels is in fact quite extraordinary; they were used in the past to provide assistance and refreshment to travelers and pilgrims. Lake Iseo is not known for its beaches. However, a particularly nice one can be found near the town of Iseo. It is a public beach of around 2000 m2, a green oasis within walking distance from the historic town centre, and features a good restaurant. The Valcamonica has a wealth of rock art left by its inhabitants during thousands of years of history that has stayed almost intact. The rocks, from a geological point of view, are Permian sandstones, formed in the last period of the Palaeozoic age, the Permian (280-225 million years ago). Huge bulks of debris were carried by powerful rivers in that age and slowly piled up in continental basins where the combined action of time, mechanical and chemical reactions turned them into stones. The subsequent geological events (elevations and erosions) shaped them. On these rocks the first dwellers of the Valcamonica begun to carve the signs of their thought and spirituality.There are a lot of rocks to see in the park, all with several themes and engraved in different periods. Located in a clay reservoir, the Pyramids are hoodoos (also known as tent rocks, earth or erosion pyramids, or fairy chimneys), which result from prolonged erosion. Layers of clay are washed away all around boulders, with the latter protecting the clay deposit directly underneath them. Year after year of such erosion has left a surreal landscape marked by boulders perched on top of spindly towers of clay, some reaching as high as 30 meters (98 feet). The scenery can be taken in from the road, but it is worthwhile venturing down the steep trail that snakes through the Pyramids. Although part of the trail can be challenging, it is relatively short, and it could be completed in 30 minutes. However, allow at least one hour for appreciating the spectacle from down below. Bear in mind that the site is in continuous change due to erosion, and caution must be taken when walking under the Pyramids. I never enjoyed a summer holiday more than the one at a campsite near Malcesine. Where a hammock, Italian ice cream, plenty of sunshine, a pebble beach, an air mattress and my new best friend Cardia van Bemmelen provided all the fun a 7 year old could wish for, back then the main tourists in those days seemed to be mostly Dutch. Early seventies Lake Garda was as beautiful as it is today, with charming villages, lemon trees and exotic flowers everywhere and crystal clear blue waters – perfect for swimming. But it had yet to be discovered by mass tourism. I would say that Lake Iseo today reminds me of those times. When my husband and I decided in 2010 to look for an apartment in Italy we focused on Lake Garda. After visiting it only once, he was smitten too and could see us spending many a holiday there. It did not take me long to find Madeleine Morgan’s Dreamhomes and then our journey really took off. And it was Madeleine who introduced us first to Lake Iseo. Like many people, I had visited all the larger north Italian lakes (Maggiore, Como, Garda) but not Lake Iseo. Each lake has a personality of its own. Compared to Garda, Iseo is much smaller, more secluded and less polished. It seduces you quite differently. If Lake Garda is the extravert spontaneous girl, Iseo is her more serene, mysterious sister. It was its “inspiring authenticity and grand beauty” that made world famous artist Jean Claude Christo select Lake Iseo as the location for “The Floating Piers”, earlier this year. Lake Garda has a sub-mediterranean climate. This basically means lovely mild weather but a few more rain showers in summer than say, the Amalfi Coast.Lake Iseo’s climate is alpine, with olives and horse chestnuts rather than lemon groves and palm trees. Summers are very sunny but generally a few degrees cooler than Lake Garda. Iseo also borders the Franciacorta wine region, famous for sparkling wine made in the Champagne method. Franciacorta was recently hailed by international wine connoisseurs as Italy’s best new sparkling wine, and chosen as the “Official Sparkling Wine” of the Milan Expo 2015. Needless to say that interest in the region is starting to soar. Back to 2010. 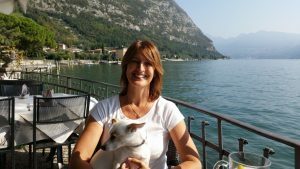 Madeleine showed us many appealing apartments, first at Lake Garda and then at Lake Iseo. And I cannot deny we were more than a little pleased to find that at Iseo, we could get substantially more for our money. Iseo has not got the star power of sister Lake Garda – yet. But the quiet beauty, authentic atmosphere and wonderful restaurants with both delicious and very affordable food, certainly made us fall in love with her. Have you ever looked at the dark sky outside, the heavens opening up with rain and the pale reflection looking back at you in the mirror on any given day and thought, yes that’s it I want bright sunshine, sandy beaches, latino music and a mojito …………..hellooo I am going to move abroad!!! The first step is taking a look at where you would like to go, the type of life you have always dreamed of and what type of property you would like to purchase!!! Take your time to decide – it’s an important move so ask yourself why you are doing it and what you wish to achieve . Do you choose a location where you can still have all your golden favourites …… a good cuppa tea, a great pint, a cheese burger or kebab and curry or are you looking for that exotic location where you wanna change your life style completely and freefall into a new dimension!! Well the number one rule is to explore your location, spend time there on holiday in all seasons to see what’s it like, the locals, the food, the cost of living, accessibility to other areas, airports and travel, beaches, lakes, mountains and cities close by. Property viewings – whatever country you choose always remember to also choose a trusted property agent, someone who specializes in the area that you are interested in and speaks your language so there are no barriers and above all, someone who is fully qualified as a realtor and a good listener. Explain in detail what you are looking for and the locations that you are interested in as well as your budget ( including or excluding purchase taxes ) and your reasons for purchasing so that the agent is fully informed, this is to avoid them taking you on a wild goose chase and wasting valuable time. Don’t purchase more than you can afford – it may be that you might fall upon a great property that is not in your actual budget, please please don’t be tempted until you know that you can comfortably and I use that word with a certain emphasis, purchase without creating any stress on your financial situation. Always look the property over both inside and outside and before signing any paperwork discuss at length, if necessary with an independent lawyer. Request the legal documentation for the property and if it is new or off plan make sure if there are any legal requirements that need to be covered by the developer. Mortgages – if you need a mortgage to purchase then prior to viewing any property please make sure that you have your lending in place and that you can actually borrow the funds. If you are looking for a mortgage in the country of your choice then you should probably use a financial advisor who will have access to more than one lending institution and can help you to understand if you qualify for a mortgage in the first place. Don’t be too hasty – think carefully before making any deposits on any property, I normally ask my clients to give some serious thought for at least 48 hours and then come back to me. Don’t forget about tax laws in that country – do make sure that you fully inform yourself of the tax laws both inheritance tax, property tax and capital gains tax should you decide to sell. You will need to speak to either a good tax lawyer or equivalent to understand the implications of your choice. Always find out what the laws are with regards to Wills and Testaments to cover your family. Don’t forget about fluctuating exchange rates – this is a very important point as it could mean a big price difference should your currency deflate. In these cases I normally advise a good currency broker who can assist you to obtain the best exchange rates in order that you are not caught out. Options – if you are thinking of relocating it would probably be a good idea to keep your options open, if you have a property in your country maybe keep it and rent it out for a period until you are sure about making the move permanently. That way you have a fallback should it not work out. Language barriers – remember that if you are seriously considering a move abroad you either have to choose a country where they speak your language or get used to the idea that you are going to have to learn the language at some time. On this note it would probably be a good idea to frequent night classes, take an internet course or buy some language dvd’s to listen in the car on the way to work to get a head start! Golden rule – Don’t rush into anything, this is a life choice and it has to bring you joy and happiness so think things through……..